Chickens used for their eggs, known as “laying hens,” are subjected to the most horrific abuses of the factory farming industry. Ninety-nine percent spend their lives in cages with a floor space smaller than the size of a sheet of paper. The male chicks, who cannot lay eggs and are not bred to produce enough flesh for meat, are ground up alive in a macerator, gassed, or electrified to death. One hundred million chicks a year are killed in this way, immediately upon hatching. 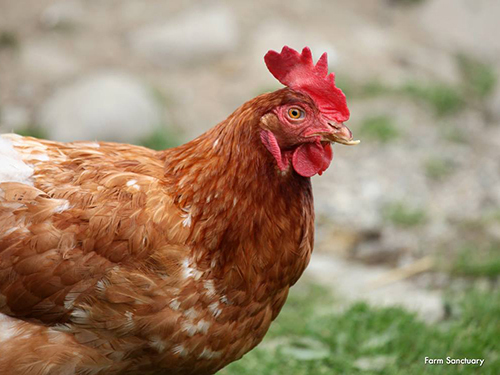 In the United States alone, more than 305 million hens are used for their eggs. Crammed into battery cages with up to 10 other chickens, they are unable to walk or even spread their wings. They are forced to defecate and urinate on one another. These filthy, cruel conditions result in bruises, feather loss, and infection. Although chickens are naturally friendly and social, the stress of confinement makes them peck at their feathers and each other. To alleviate this problem, factory farms “debeak” chickens at a young age—painfully slicing off the beaks with a hot blade even though they are filled with sensitive nerve endings. Sadly, as our country’s demand for eggs skyrockets, chickens are the victims of increasingly tortuous methods of egg-production. A century ago, an egg-laying hen would produce 100 eggs annually. Now, through selective breeding, they produce up to 250 eggs per year. When production decreases, factory farms will use “force molting”—starving hens for up to 2 weeks to shock their bodies into producing more eggs. After 1-2 years, less than half the normal life span of an industry farmed chicken, hens are considered “spent” and sent to a slaughterhouse. In a final act of extreme cruelty, these birds are crowded into a truck where they suffer broken bones and exhaustion. Those who make the journey alive have their throats cut and are thrust into scalding hot water to remove their feathers. Many miss the throat-cutter and remain alive for this horrific process. We currently have zero federal laws protecting chickens from abuse, although the majority of Americans say they are in favor of such a law. These sweet and social creatures like to spend their days together, pecking for food and taking dust baths. Scientists have found that they are as intelligent as cats, dogs, and even some primates. Although a recent spate of companies market the happy, “cage-free” or “free range” chicken, these labels are incredibly misleading. Cage-free producers purchase their hens from hatcheries that kill millions of male chicks per year. They continue to use the cruel debeaking process and pack chickens into warehouses without windows or ventilation. They also slaughter chickens using the same methods as factory farms once their production declines. Similarly, the US Department of Agriculture has no standards for the outdoor access allowed to “free range” chickens. Adopting a vegan lifestyle is without a doubt the only way to end the suffering of these animals.